This is a brilliant training course open to everyone to be equipped to pray for others. To register please click here. Prayer is lots of things! It's asking, it's listening, it's crying out to God about the things we are overwhelmed by, it's hard work at times and then sometimes it's exhilarating and time flies whilst we pray and we wonder why we don't do it more! Jesus prayed, he taught his disciples to pray, "When you pray....." (Matt 6:6) and assumes prayer will be part of the rhythm of our lives as we follow Him. So, why have a week of 24-7 Prayer at Woodies? Well, 'Unless the Lord builds the house, those who build it labour in vain.' Ps 127:1. Dave loves this verse, it's a real bedrock to life at Woodies and it sums up why we pray. We need God to build our church and we want to keep in step with his Holy Spirit while we're joining in. 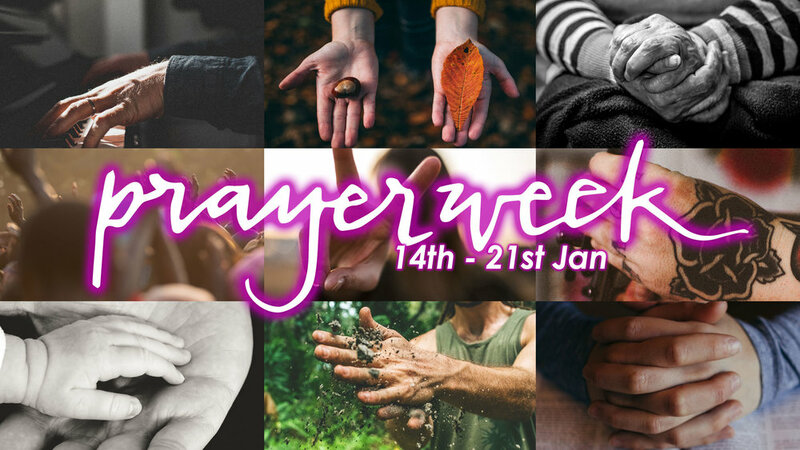 Prayer Week is us saying to God in a corporate way at the beginning of a busy term, "We need you, we have plans and dreams for Woodies and the city but we want to seek your perspective and power first and foremost." There are 3 opportunities to join in, could you choose 1? 1. Sign up for a 1 hour slot in our 24/7 Prayer Room via this link; we have 168 hours to fill! The Prayer room is themed around our Vision of helping people FIND Jesus, LOVE one another, then FOLLOW Jesus and SERVE the city. 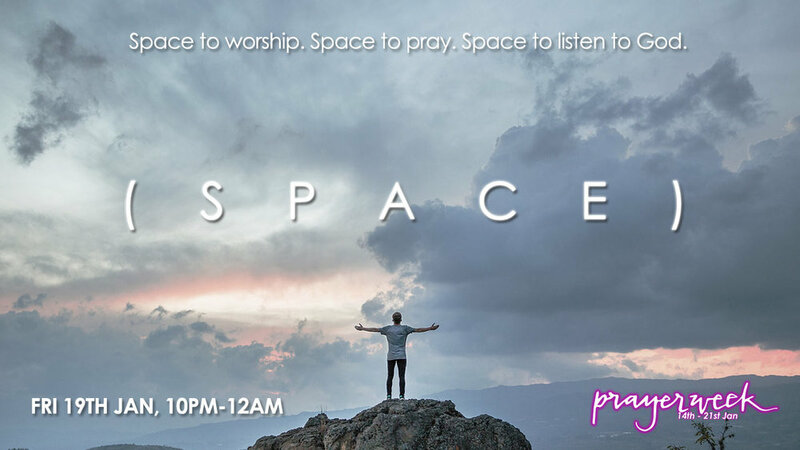 There will be lots of ways to pray for our church and also space to be quiet in God's presence and enjoy His company. 2. Find an hour to pray through the '1 hour of Prayer Guide.' Take it on a walk or use it during your commute to work/Uni/School or find a quiet spot in your home. Try dividing it into 3 sections if it helps. If you've never prayed in this way before, we'd love you to try it. 3. Come along to early morning prayer watch on Tues 18th Sept at 7.15-8.15 am in the Foyer. There will be fresh coffee and pastries, worship and prayer. The prayers said this week will change situations and usher in God's kingdom in new ways, lets expect our faith to increase as we focus on our amazing God and his incredible power. And lets allow ourselves to be changed as we spend time with Jesus and welcome his Holy Spirit to revive us, our church and city. 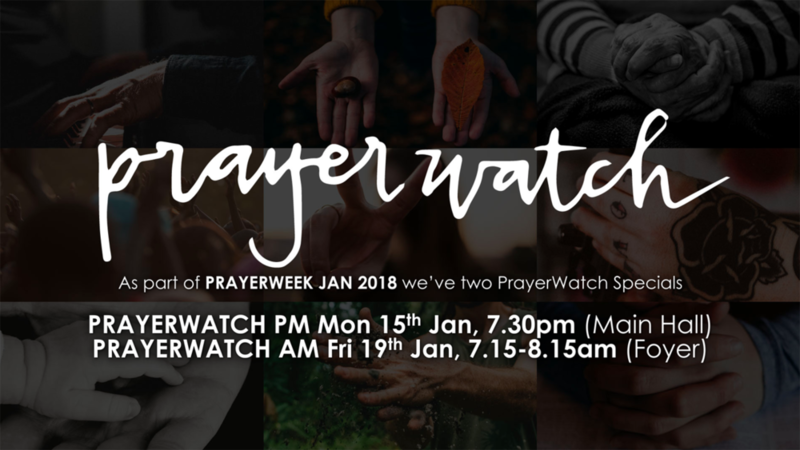 Have a great 24-7 prayer week, find a way to join in and lets pray! 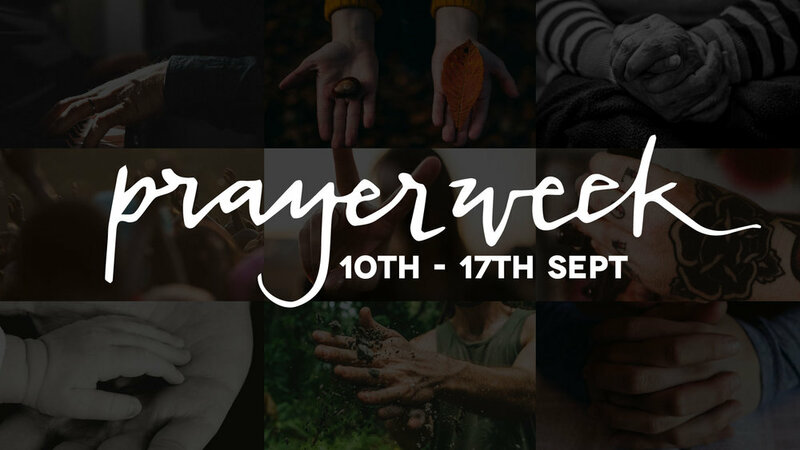 Every day during PrayerWeek we’re asking you to pray for one of our congregations. Watch the short video and then pray, its as simple as that! If you have any feedback, prophetic words or general encouragement's do send them in via our website. 1. Pray that our appetite for prayer and communing with our Father would deepen. That God would put a growing hunger for prayer in us this week that continues. 2. Pray that many people would come along to our Alpha course which starts on January 24th, especially guests who came along to our different Christmas services. For people to meet Jesus as their Lord and Saviour. 3. Pray for a special increase in the presence of God this week at our services, gathered prayer times and activities as we serve the city. That his Holy Spirit would be at work in everything we do and we would look to him and follow. 1. Development of our mid-week groups and community life. We want to strengthen our existing Hubs and start up new ones. 2. Alpha and people coming to faith. Pray that we're able to have a good number of people engaging with Alpha this term, as well as leaders to run the group. 3. Development and delivery of the Metro mentoring system. Pray that God helps us with our initiative to disciple members and develop leaders. 1. Pray for a fruitful and life transforming witness of Highgrove in Seamills, esp in local schools, community cafe on the square and among friends and neighbours. 2. Pray for our youth ministry which is growing, ask God to provide some great leaders who are passionate about serving in this crucial area of ministry in our church and community. 3. Deepening discipleship for those who are new and not so new to faith, that each person would find their place in the church community. 1. That as a congregation and as individuals we would make time to and learn how to 'keep in step with the Holy Spirit'. 2. Pray that in all our activities, food bank, chaplaincy at Southmead Hospital, childrens/youth groups, life recovery group etc we would respond to the Holy Spirit's leading as we encourage, prophesy over and minister to those we serve. 3. We long for people to come to know Jesus, please pray that those we mingle with in our families, neighbourhood, workplaces and church would meet Jesus personally and have their eyes opened to his love and grace. 1. Pray for Matt Smith and Miriam as they move to Branch and serve that church and community. 2. Pray for seeds that have been planted in the past in Brentry to grow and bear fruit this year. 3. Pray for the families and young people that Branch interact with through the children's centre and wider community. Pray for lots of opportunities for Branch for share Jesus love with them. 1. Relationships with local families to deepen and bear fruit and an end to some anti-social behaviour directed at the church. 2. Pray for Little Saints toddler group, the girls group, Growing Saints kids group. For growth in these children's/teenagers faith and for those that lead the groups too. 3. Wisdom for the church leaders as they steward growth and raise up new leaders. "If we want to leave an indelible mark on the world there is no more powerful way to do it than by joining in God's purposes through prayer. Our prayers can go where we cannot. While many things may seem impossible from a human standpoint in the realm of prayer there are no impossibilities." - Brother Andrew. One of our hopes is that everyone will find one hour this prayer week to pray. I get goose bumps thinking about all those prayers! Praying for an hour can seem a daunting task, so here are some things that may help. Print off the 'hour of prayer' guide. Plan when and where you're going to do it. I love to walk and pray, the rhythm of one foot in front of the other really helps me. Others like to sit in a favourite chair, some get up early, others like to pray in the middle of the night, others during their lunch hour. What place and space will work best for you? Book the slot into your diary. Before you get going take a moment to prepare yourself. You could listen to some worship, or read some verses from the Bible that inspire you. Turn your phone off so you won't be interrupted, ask the Holy Spirit to settle your heart and mind and help you to pray. If distractions come don't worry about them, pray for them. The hour of prayer guide is just that. It's there to support prayer not limit it, so if other things come to mind that need your prayer then that's fine. Make a note of anything that you sense the Holy Spirit showing you. Expect him to speak as you draw near to Jesus. Feedback to Woodies leaders anything that you sense God saying to us a church, we would love to hear from you. Let's make space for prayer this week, lets dream big, pray big and trust God for the results.